When I wrote the first edition of Building Your I.T. 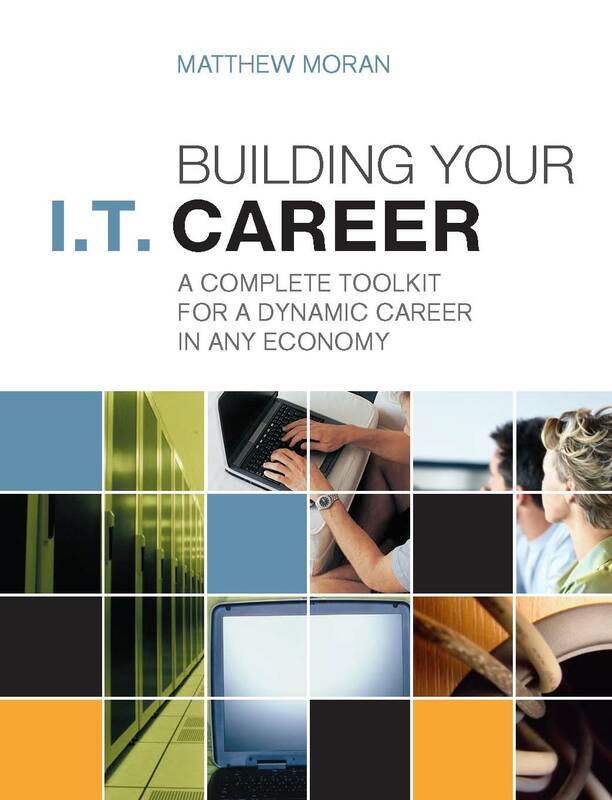 Career (formerly, The IT Career Builder’s Toolkit), we were in a trying time for the I.T. professional. The fallout and general malaise of the dotcom bust was only a couple years in the past. Outsourcing and conversations about outsourcing dominated much of the conversation. A general doom and gloom mentality seemed to be firmly ensconced in the psyche of the I.T. industry and those looking to build a career in I.T. At the time, I wrote, “Why Technologists Must Learn to Speak Business”. The article was a bit of a rant and a rebirth. I’d been consulting for many years and watched many computer professionals contribute to a general business backlash against the I.T. industry; a cynicism that prompted caricatures like Saturday Night Lives computer guy – Nick Burns. A study by KPMG & Computerworld at the time arrived at some damning perceptions about I.T. in general; concluding that I.T. could not be trusted to understand or deliver true business solutions. At the time, I placed the impetus for correcting this perception on the I.T. Pro. There were/are some believe this is unfair. My reasoning was NOT that I.T. was the only culprit or that the caricature was always true… It is simply that I live in that world and speak to that audience. Meaning, as a long-time I.T. professional, my focus is on helping my “brothers and sisters” – those in IT/MIS disciplines – to take as much ownership as possible for their careers and creating a positive perception of the high-tech professional. That was the rant.. the rebirth was more a fulfillment of a personal dream to be a writer; an author. Writing that article was a first step.. several articles followed, covering technology, business, social media, and even parenting. Then, the publication of my first book. And now here we are, several iterations and economies removed from the dotcom bust.. but true to form, economies cycle and we’ve been through several more years of malaise. Driven by other factors but the result is the same. With the new edition of Building Your I.T. Career and with this blog, I once again place primary impetus on you, the I.T. professional, for creating a dynamic and rewarding career in I.T. As we progress down this road, I want your input, questions, suggestions, etc. Be Proactive! Be Positive! Add Value! Share Opportunity! Empower yourself to be in the best position to take advantage of opportunities as they arrive. In both perception and practice, be the “go to” person. This is critical! View yourself and Information Technology in a proper context as a value-added component to the business you serve. This means, you must understand and empathize with the business more than the technology. Remember, technology is a tool to help the business achieve clearly defined objectives. During bad economic times, there are people thriving. During great economic times, there are some who struggle. In the end, the “Economy of One” is the most critical. Put yourself in a position to view yourself as a personal economy. You will have to deal with the realities of the global economy but if you turn over all ownership of your career to the global economy, you subject your “Economy of One” to a roller coaster cycle that is not enjoyable. A lot of I.T. professionals are consumed with the average pay for their position. However, any given employer may place greater or lesser value on your given skillset. In the end, you cannot necessarily bemoan an employer who is not paying you the average salary. Plus, pay may not be the only or best factor to determine whether a job is the “right one” or “good.” There are times you will trade pay for opportunity and times you need to look for an employer who places greater value on your skills than another employer. I’ve had challenges in life and career, some I’ve created, some that have been “inflicted” upon me. This is life! Dave Ramsey talks a lot of Murphy coming to visit (ie: Murphy’s Law) and preparing for and expecting it. So what? Who cares? What’s next? So.. I hope we can enter a conversation, take advantage of boom times, and do better than weather tougher times; I want us to thrive. How does sound to you? In my opinion, I think that outsourcing will be the main topic in most conversations because that is the main reason why many IT positions are being outsourced. To me, it will always be my main concern. That word bothers me because I don’t want to constantly jump from one job to another. I have encountered with someone before that say that their position was eliminated because their company outsourced. I was at a Data Convention and talked to a gentleman at a booth. We were talking about IT careers and he say, “Well you know, IT positions are constantly being outsourced. Your position is never secure. That was what happened to me.” Recently, I had a very good tip from a person on LinkedIn, he say to prevent you from being outsourced, you have to become a specialist at something. This, as he said, come from his experience. I believe this is a very good tip, not that it will promise you that your position will be secure, but you will atleast have an advantage for not to be outsourced. I also agree with you that you cannot whine about not getting paid enough. Yes, it absoulutly depends on your skillset. Especfially for someone like me that is just starting out with little to no experiences, you cannot expect to get paid as much as someone with 5 years of experiences. You have to work you way up. It is very true, like you said, “trade pay for opportunity.” It might be hard in the first place, but as the years go by, and you finally get to that senior level position, it will all be worth it. My concern is, How and who will give me that opportunity to start out? In this ecomonic time, it is hard, companies want people with 5 plus years of experiences. Thank you for commenting Trish. I’ll cover outsourcing in the next couple weeks since questions about it arise often. However, a short response is that your ability to bring value to the businesses you serve is always the thing that cannot be outsourced. All I.T. professionals (all employees) need to think in terms of the value they bring their organizations.